Drawing on four generations of success, Homes by Tradition has built a reputation of exceptional homebuilding and customer satisfaction. As Twin Cities’ premier custom home builder, we pride ourselves in creating the highest quality, architecturally rich homes, featuring the latest design trends and amenities. Below is some information to help you learn more about our company and our custom homebuilding process. Quality, Integrity & Innovation – From concept to completion, we make sure your home is built to the highest quality standards with the most current techniques and innovative products. We align ourselves with the industries best suppliers and skilled trade contractors. Unique Custom Homes – We specialize in design and building custom homes from the ground up. Many of our customers come to us with a blank piece of paper, and from there, we work together to create a custom home design that meets their specific needs and budget. We listen, learn, and gather information about you, your lifestyle, and your needs. The result? A custom built home that truly reflects your style. To assist in the selection process, our in-house professional Designer will guide you through each step. From paint colors, to flooring, and everything in between, she helps the process move smoothly. For more information on our process, click here! Building On-Your-Lot or in Our Communities – Whether you’ve fallen in love with a lot somewhere in the Twin Cities south metro area, or you’ve fallen in love with our Spirit of Brandtjen Farm or Reverence community, we can design and build your dream home to maximize your property’s potential. Although our communities are among the best in the Twin Cities market, we build a majority of our homes On-Your-Lot with extensive knowledge and expertise in the south metro area. Standing Out in South Metro – The Twin Cities south metro area has been our bread and butter since we started in 2005. Designing homes from the $650K price point all the way up to $2M+, we have established a reputation as the builder to seek out for a rewarding design-build experience. Recognized in the Industry – We take pride in our work and have received numerous industry awards that celebrate our expertise and home designs. Our awards include 6-time Reggie Award winner, Best of Houzz – Customer Service, Parade of Homes Dream Green Home Winner, and Builders Association of the Twin Cities Foundation Dream Home Recognition Award for supporting the community. 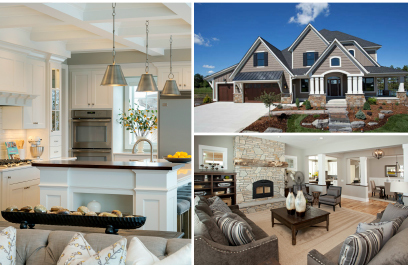 Our Model – Stop by and tour our current model in Spirit of Brandtjen Farm. This $1,196,000 custom home is a must-see with its urban farmhouse design and sweeping lake views from all three levels. Come THIS SATURDAY to Meet the Builder, Dean Nelson, from 1:00-4:00pm and pick his brain about anything home related! For more information on our company and our custom homebuilding process, call 612.363.6034 or email info@homesbytradition.com and we’ll be sure to answer any questions you may have!